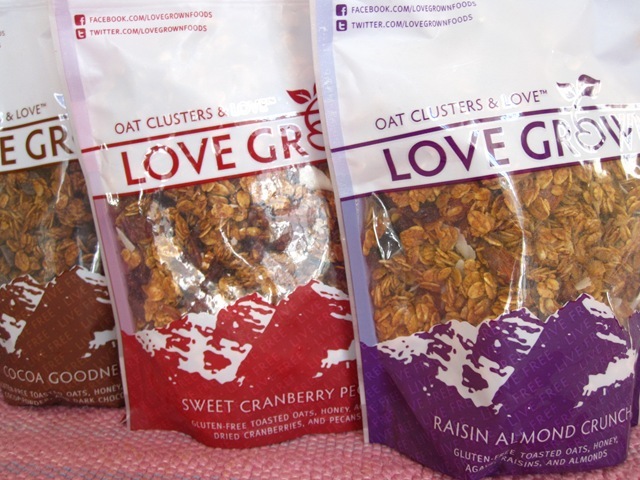 that granola looks GOOD esp the choco one.. love me some choco!.. i wear asics.. nothing fancy- i want your cool looking ones! MAN, DO I WANT THAT GRANOLA! And yes, Darren is straight.. saw him on Ellen… but it’s so funny – his mannerisms are so feminine! I’m a true Asics girl. I have really high arches, and I need some newbies.. maybe I should try out some other brands though! MMM girl that granola was the bomb.com. So good. I love love love Nikes. We can run together and be twinnies! It would be perfect. 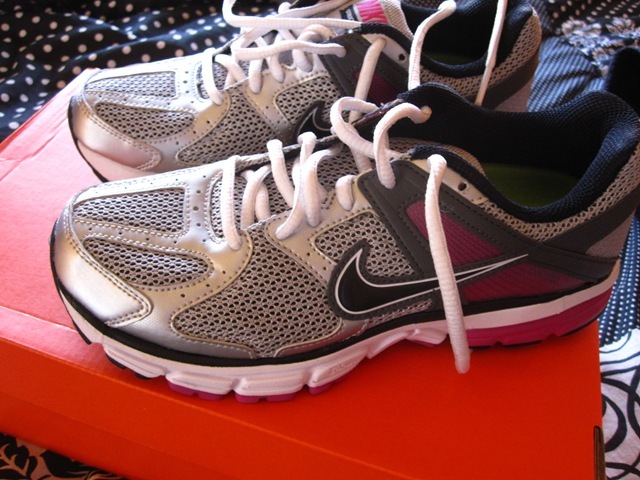 My new Nikes are grey and pink too. 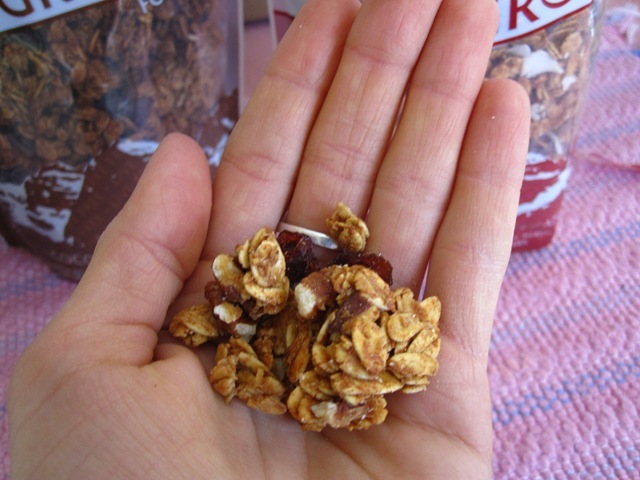 I need nuts in my granola! 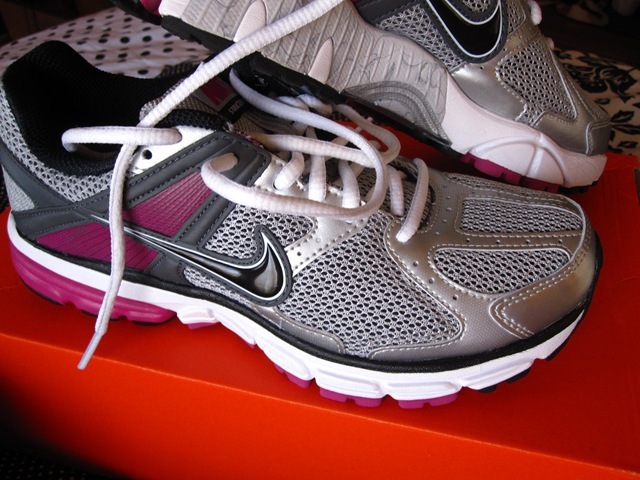 And my favorite running shoes are Brooks’. I might run outside today too, it’s so nice out! I’m def a gleek—but I missed this week, so I’ll have to catch up today! The mizuno running shoes have really worked for me for a while. …but I did buy the Merrell Barefoot shoes, and can’t wait to test them out running (so far, they’re great for my AMT obsession!). Darren is soooo good looking!! 😀 I run in nike structures and love them. I absolutely love the new ones like you have, and hope our school gets them soon. They look a lot better than the last model!! oh you are glowing girl, love that post run sweat! 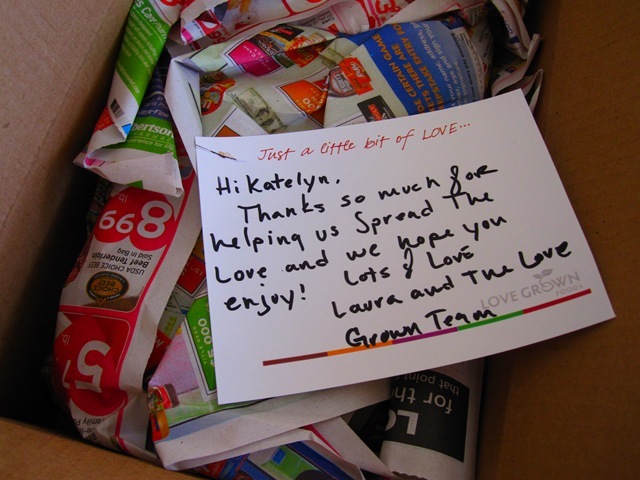 And of course, I love the LOVE GROWN! happy friday! I’m a gleek as well. To top it all off, I was in show choir and a cheerleader too. Double Gleekness. i know i don’t comment a lot, but i read, and i think you’re freaking adorbs. even sweaty!!! today i indulged in chickfila nuggets! i never eat their nuggets but darn they are good! 🙂 happy friday! ooh yes love clumpy goodness! I tried on Nike Frees, but I went with green Saucony Kinvaras! I love them, and they are definitely helping me strike midfoot vs heel foot. I know because my calves are sore after running! Congrats on the 8 miles girl! I did 7 miles in the beautiful sun today…there was so many runners out. Made me smile! 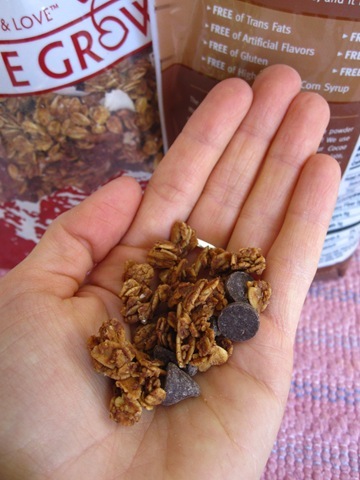 That granola looks amazing…I actually don’t eat granola a lot but almonds and chocolate are good in granola=) I have the same problem with glee boys, I totally swooned over Jonathan Groff when he was playing Rachel’s boyfriend, but he is for sure gay in real life. I love my Brooks that I got fitted for because they actually give my crazy arched foot the support I need! My faaav running sneakers are ASICS and I will never go back to any brand. LOVE THEM! I love um abs everything about this post!! I LOVE your new shoes and I LOVE that you have influenced your parents not your eating style 🙂 thats so amazeballs! And I def want to try some of that granolaaaaa! Oh and I got my new brooks (green silence) which help with the midfoot strike its def helping!! um can we go running together? okaysoundsgoodbye. 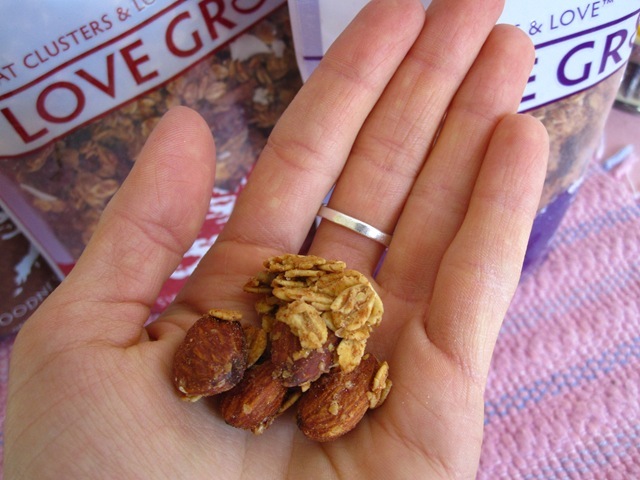 Oooh, that granola sounds awesome! Gonna have to find me some stat! I am not a runner but do attend Zumba 2 times a week and body toning classes 2 times a week. Then between you and a couple ladies at the gym I was encouraged to try my first spin class, WTHeck? OMGosh pain in the booty. I was told that after a few times that will not happen anymore so I am going to go back each week. I make my own granola bars with dried cherries and enjoy life chocolate chips, super yummy and chewy. I’m a total Gleek! And I love that man! granola = danger! I can’t stop my self it is oh so good! 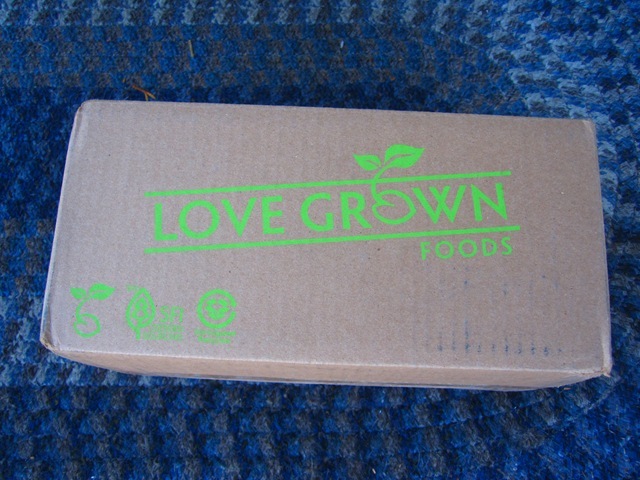 I haven’t tried Love Grown yet. I am a Nike or Puma girl. Right now I switch off between some lime green Nike Free’s and Purple Pumas! love the color of those frees — so so cute! !